Dr. Jon Roller teaches in the Worship Arts program and also heads up the chapel music program. He is interested in and loves virtually all types of music but has a special interest in contemporary Christian music and world music. He is very active in music and discipleship at his church in Lexington. Jon loves teaching but his primary interest is in the spiritual life of his students. 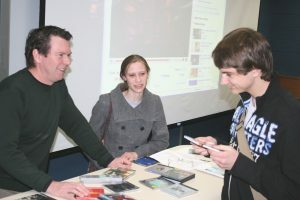 In the picture, Jon talks with his students just before their Music Appreciation Class final.